Do you have sudden onset of spinning or dizziness with lying down, rolling over in bed, with rinsing your hair in the shower, or with bending over? If so, you may have benign paroxysmal positional vertigo (BBPV), also known as positional vertigo. In most cases, physical therapy can resolve your symptoms in 1-2 visits. Positional vertigo is an inner-ear problem that causes short periods of dizziness when your head is moved in certain positions. It occurs most commonly when lying down, turning over in bed, or looking up. 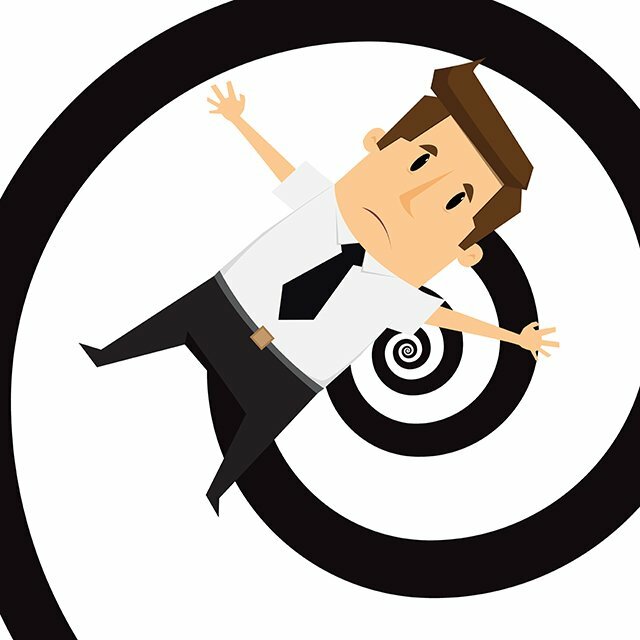 This dizzy sensation is called vertigo. Positional vertigo typically provokes a brief spinning sensation with certain movements or position changes. It is caused by calcium carbonate crystals, or otoconia, which we all have in our inner ears. When you move your head a certain way, the crystals move inside the canal and stimulate the nerve endings, causing you to become dizzy. Positional vertigo may occur for no reason at all, but is more common after a head trauma such as a car accident or a fall, or prolonged head-tilt, as you might experience at the dentist or hairdresser. We are specially trained to treat people with neurological problems such as positional vertigo. Your therapist can quickly identify whether you have positional vertigo by manipulating your head in specific ways to determine whether vertigo and involuntary eye movement results. These tests will help your therapist determine the cause and type of dizziness. Depending on the response to these tests, your therapist can perform a treatment to move the crystals back into the correct chamber, which cures BPPV in nearly 90% of people within the first two visits.